[PDF] The Russian Origins of the First World War | Free eBooks Download - EBOOKEE! Description: The catastrophe of the First World War, and the destruction, revolution, and enduring hostilities it wrought, make the issue of its origins a perennial puzzle. Since World War II, Germany has been viewed as the primary culprit. Now, in a major reinterpretation of the conflict, Sean McMeekin rejects the standard notions of the war's beginning as either a Germano-Austrian preemptive strike or a 'tragedy of miscalculation'. Instead, he proposes that the key to the outbreak of violence lies in St. Petersburg. It was Russian statesmen who unleashed the war through conscious policy decisions based on imperial ambitions in the Near East. Unlike their civilian counterparts in Berlin, who would have preferred to localize the Austro-Serbian conflict, Russian leaders desired a more general war so long as British participation was assured. The war of 1914 was launched at a propitious moment for harnessing the might of Britain and France to neutralize the German threat to Russia's goal: partitioning the Ottoman Empire to ensure control of the Straits between the Black Sea and the Mediterranean. Nearly a century has passed since the guns fell silent on the western front. But in the lands of the former Ottoman Empire, World War I smolders still. Sunnis and Shiites, Arabs and Jews, and other regional antagonists continue fighting over the last scraps of the Ottoman inheritance. 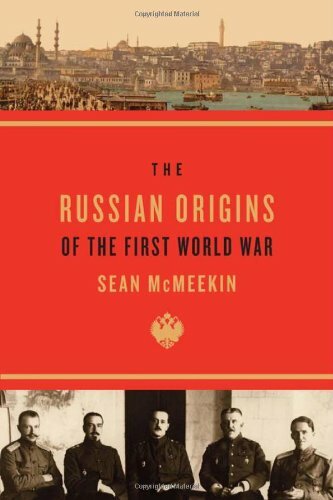 As we seek to make sense of these conflicts, McMeekin's powerful expose of Russia's aims in the First World War will illuminate our understanding of the twentieth century. No comments for "[PDF] The Russian Origins of the First World War".